5. In left column click on My Events at top of list. 7. From there, you can see what you’re registered for and can cancel instantly. No-Shows’ will be charged $20.00 and will not be permitted to attend future classes until fee is paid. “No-shows” will be charged $20.00 or forfeit tuition, whichever is higher, and will not be permitted to attend future classes until fee is paid. Cancellations must be received before class by canceling online or by faxing (504) 888-1812. No verbal cancellations. All cell phones, laptops, and other electronic equipment must be turned off during class. Phone calls are limited to your breaks only. How many times have you talked with a “wanna be” investor, spending hours trying to help them find a deal, only to have them give up and waste your time? Investors do not think like typical home buyers, which is where the disconnect often happens. There are many benefits to working with investors, but it may take some studying on your part. Learning how an investor thinks, strategizes, and plans is essential if you want to pursue a career working with investors. Come spend an hour with us on April 17, 2019 from 10-11am and get an overview of how investors think, what they are looking for and how you can potentially have a few investor clients who make up the bulk of your business. It will be a "good investment" of your time! 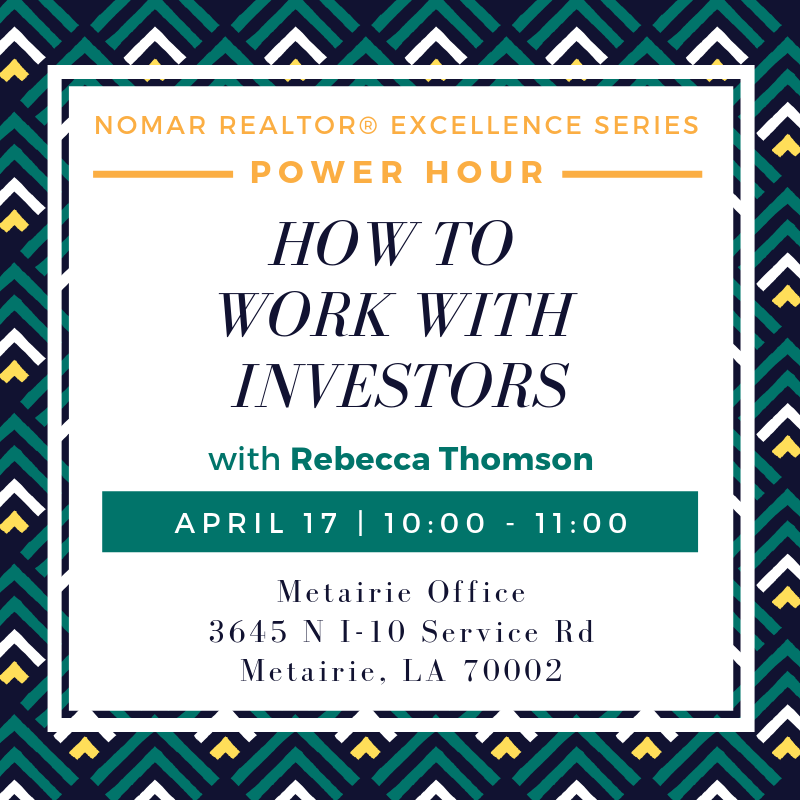 Join Rebecca Thomson as she presents how to work with investors in this REALTOR® Excellence Series Power Hour. RECOMMENDED THAT YOU TAKE BASIC MATRIX I FIRST! Hands on class, computers are provided. Leard how to get the most out of Matrix. This class will touch on the following: Data Co-Op, Hot Sheet & Market Watch customization, Realist, Market Reports, Managing Emails and Auto Emails, Speed Bar Search, Map Search, creating a Comparative Market Analysis (CMA). This is a 2 hour class, please come with your undivided attention, ready to learn! Click here to register with Louisiana REALTORS®. You will need your last name (user name) and NRDS ID (password) to register. Please call Louisiana REALTORS® for assistance at (225) 923-2210.